Sun mobility understand the needs of those whom mobility in and around the home is an issue. This new business provide a wide range of mobility aids, accessories and products with free delivery for customers in North Down and the Ards Peninsula Area. 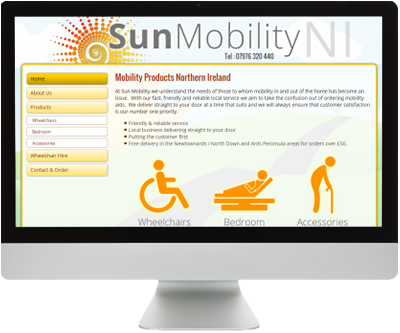 We helped develop a website for Sun Mobility that allows them to edit the product listings and make changes to the site using our content management system. Customers can use the site to make enquiries or order products. We wish the company all the best for 2015 and every success in the years to come.